cuisine. Hearty winter stews and braises give way to lighter salads, fresh first-of-the-year produce, and the lovely spring menu changes we’ve been waiting to write all year. Spring. Who doesn’t love spring? Of course, and as I’ve said before, the seasons in southern California are sort of a continuous blend, rather than the definitive change you see elsewhere. So, with this post, I am referring to New England again. Winter is hateful, which makes spring so much better. Spring menu items. The first thing chefs think of is produce. The first produce chefs think about are asparagus, morel mushrooms, fiddlehead ferns, and wild ramps. They seem to highlight and represent spring cuisine. Then it’s the proteins: Spring lamb, hams (pork slaughter is in the fall, therefore hams are first ready in the spring), game hens, the first halibuts coming out of Alaska… all wonderful and refreshing items. Farm fresh eggs. We focus on lighter, healthier and brighter items now, leaving the deep roasts and red wine braised meats for next winter. Of course, with agriculture the way it is today, and our ability to source items across the globe, the ‘seasonal change’ is felt less in food these days. We can buy fresh asparagus year round. Canada grows hydroponic vine-ripe tomatoes all winter. Do we loose our appreciation for these wonderful things? No. That’s almost as if I’m insinuating that we loose our appreciation for spring. Our moods change. Our cravings change. Our habits change. Our palettes change. One of my all time favorite spring foods is asparagus. And I don’t think I’m alone. Real asparagus. I am now speaking as a chef, and leaving spring philosophy behind. 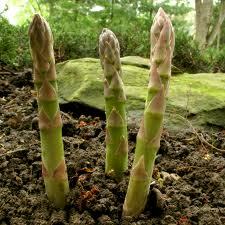 Spring asparagus (green or white) should be large stemmed and woody. If the diameter at the base is over an inch, you’ve got the real deal. Pencil, or very thin asparagus, while purposeful and still delicious, will not work, should you want to showcase the ingredient as a springtime item. Asparagus needs to be peeled (carefully! they’re easy to break), just like a carrot, to remove the outer tough layer. Asparagus always needs to be blanched in boiling salted water, regardless of how you intend to finish it. And, asparagus does not need a lot of extra seasoning to make it shine. It has enough natural flavor to carry its own weight. One tip: Asparagus needs to be cut, or trimmed. The base portion of the stalk is always fibrous or woody, and not very easy to digest. The best way to determine where to trim the bunch is by taking one stalk, and gently bending it until it naturally breaks. This is the correct length, and the remaining stalks in the bunch should all be trimmed to an equal length. 2 bunches large stemmed asparagus, peeled and trimmed. Bring a large pot of liberally salted water to a rapid boil. Have a maxing bowl filled with ice water ready (ice bath). Submerge the asparagus into the boiling water and cooking until slightly tender. This will take about 1 minute. Immediately remove the asparagus from the boiling water and plunge into the ice bath. Once completely cool, remove the asparagus from the ice bath, drain well, and gently pat dry with a towel. Prepare a grill to medium heat. Toss the asparagus with a VERY small amount of olive oil (excess will drip into the grill cause flareups, improperly blackening the asparagus and leaving a ‘jet fuel’ flavor), dash of salt and pepper. Gently grill until slightly charred. Remove and toss the asparagus with a tiny bit more of olive oil and the lemon zest. Serve right away. Best served with any spring or summer dish. It goes particularly well with bbq themed meals.